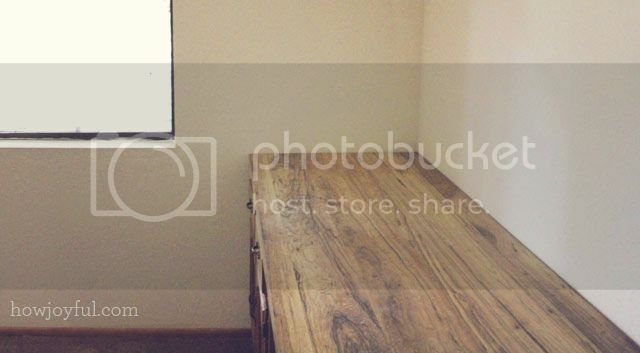 The very first project I got to tackle the week we moved (other than cleaning, trying to unpack and organizing) was the revamp for the built-in desk in the sewing room because since the minute I saw it I knew I wanted to prettify it. I guess I just needed to go out there and see what the store had, I was planning on adding a vinyl sheet as one of the top ideas on my list, but they were all a lot more complicated than just paint, so I am super happy they had the exact color tint for this pain (they only carry 16 different colors). To start I took all of the drawers and doors apart, then took all of the hardware off, clean it very well and added paper an tape around all the areas I was going to paint. 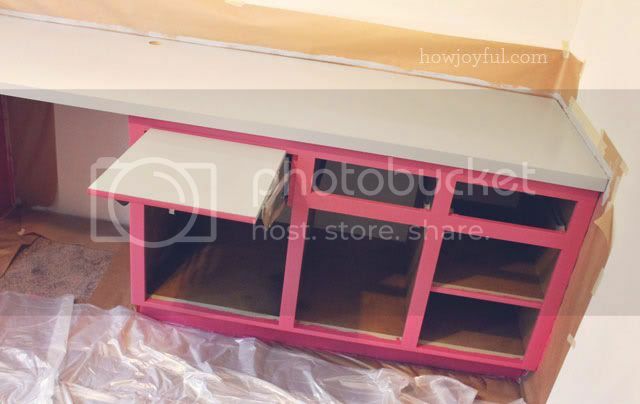 The inside of the cabinets was super dark, so I also planned on painting it (white) so that I could see in there better. 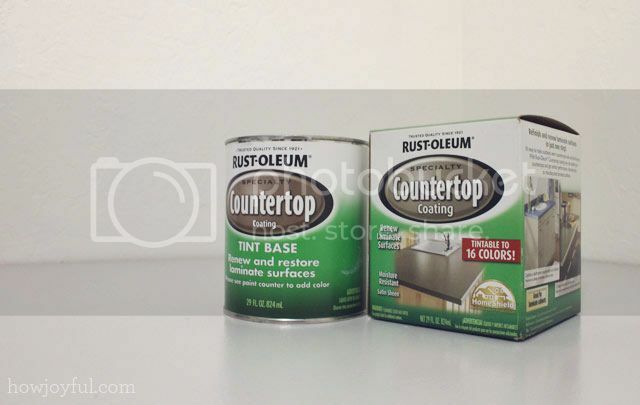 Because this is a build-in taping was kind of hard on some areas but it just required some extra patience =] For the countertop I was surprised of how good of a coverage the paint had, I could have left it with just one layer, but to be sure I did 2 anyways. 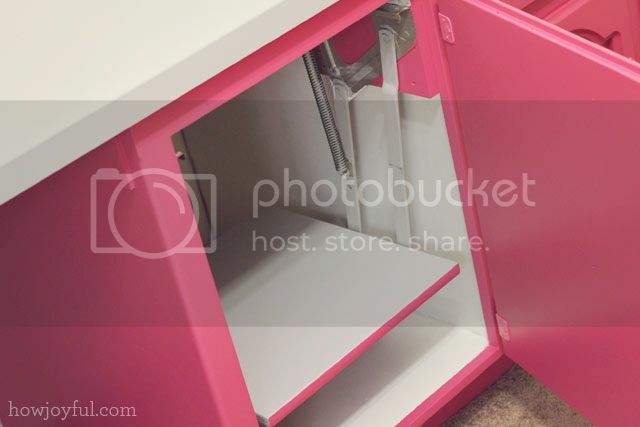 Now I just need to buy one, but with the new house and such I don't see it happening anytime soon, but at least it already has a place in the sewing room =] I just love the mechanism inside, it has a little handle in the bottom that you pull to unlock so you can put it back it. So perfect! 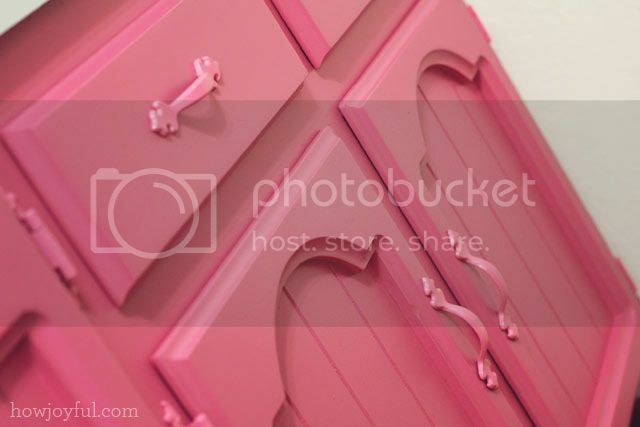 For the hardware I just spray painted with a very similar color pink, it's a shade softer but you can hardly tell. At first, I wanted it to be a hotter pink but now I think it looks good and I am starting to like it more and more. I can't wait to have more time and keep on going on the rest of the projects I have lined up, so I can unpack and start to sew again =] and don't worry I know I am still owing 2 tutorials, I hope to finish one of them next weekend so I can share it next week! I hope you all have a lovely and sunny day! I love it! It looks so pretty! :D Congrats again on your new house. I agree! So Pretty and fun! 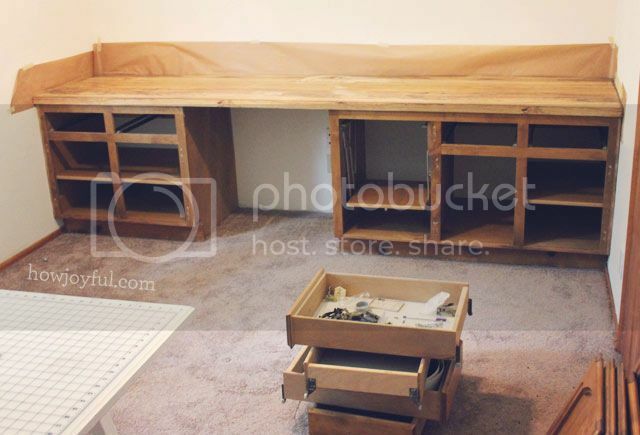 I would LOVE to sew in this space! Looks beautiful! How fun that you’re new home owners too! Congrats!!! totally beautiful!! Love it! Well done! I would Never leave that room. It says happy happy joy joy to me. Hi Kathleen, I actually used the old school brush for this, my husband also told me that it would have been way faster with the spray gun but it seemed too much work to prep for my pregnant self hehe. 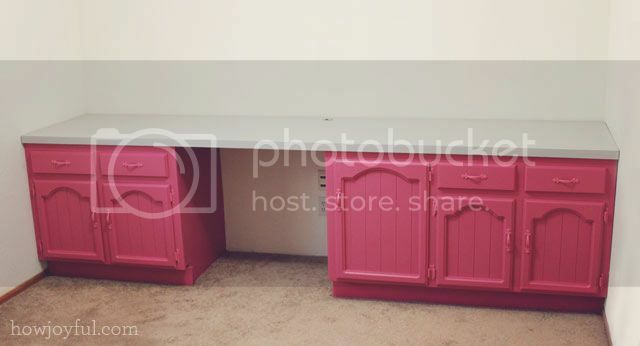 I think your cupboards look fabulous. I’m sure you will soon have the rest of your new home looking gorgeous! Your desk turned out just beautifully! I love the pink too. 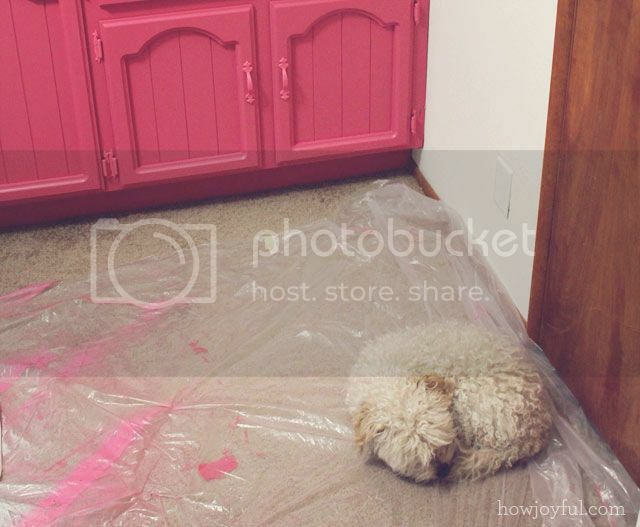 That’s definitely my color right there :) And your blog is just gorgeous as well! Visiting from our class last night! Are you planning on doing any other Alt classes? If so, I hope to see you there! This looks so fabulous, Joy! 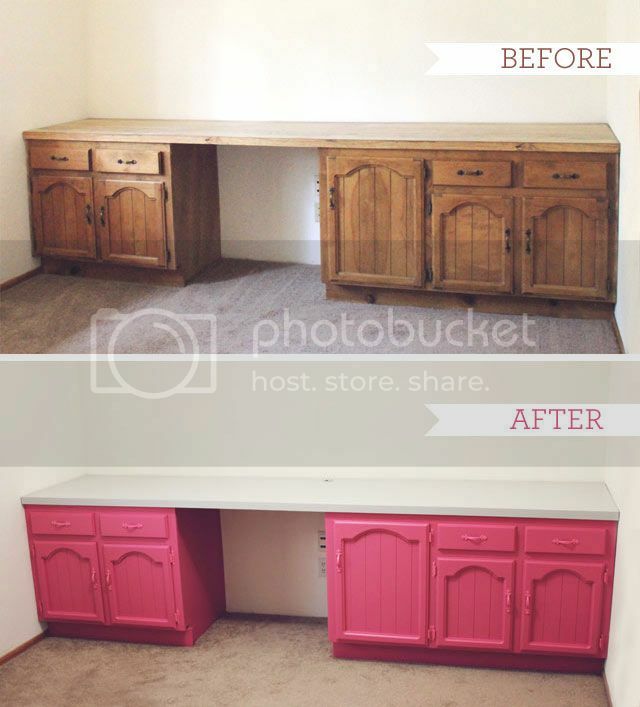 Now I need a hot pink table for my work space too!! wow. thats amazing. the classical form in combinationwith the fresh colour looks very cool. great! I love you boldness in color. Would love to see the completed room. Awesome job!!!! I’m in the middle of re-arranging (wish I could “revamp”!) my craft area in the basement. 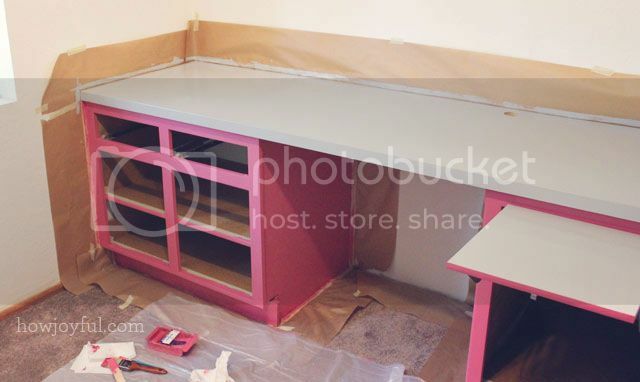 Have a long way to go, but perhaps the “L” desk should be painted a lovely shade such as this. Congratulations, too, on your impending arrival. I wish you a happy, stress-free, easy pregnancy. There is NOTHING like your first baby, it’s heaven on earth. Thank you so much Lori you are so sweet!! 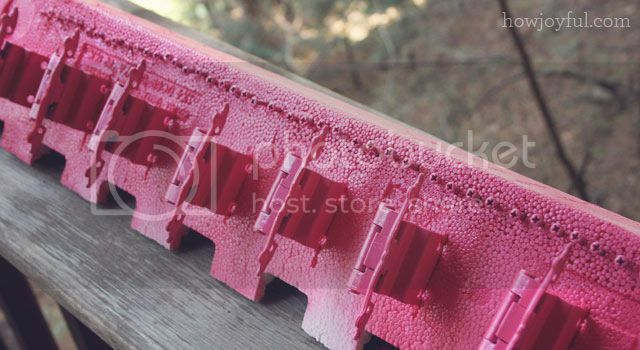 I love your styrofoam idea for painting hardware and screws. We always have a block of that lying around from my husband’s various projects. Thank you for sharing this! Enjoy your new space. It’s beautiful! Thank you Phyllis! It’s so handy to just paint them like that =] My husband now does the same thing. I love this color pink. Can you please post what it’s called and who makes it? HI. Awesome! Love this idea for a sewing machine too. Please tell me where you found the hardware? Actually all of the hardware was there already, so I am not sure where you’ll find it, maybe you can ask at Home depot or Lowes?